HeART Studio December school holiday program is out! 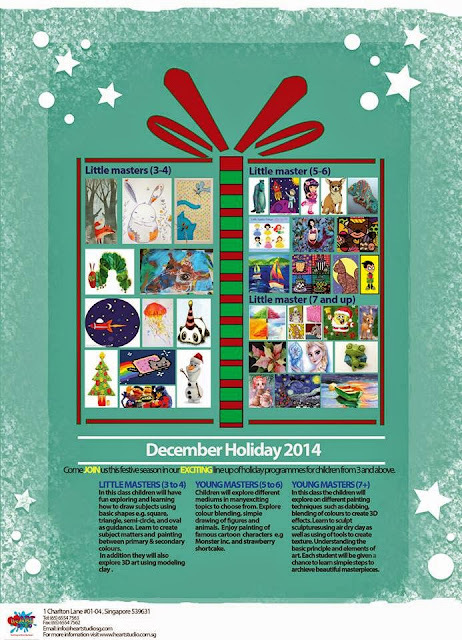 I know some of you are as excited as me because we love their holiday programs. 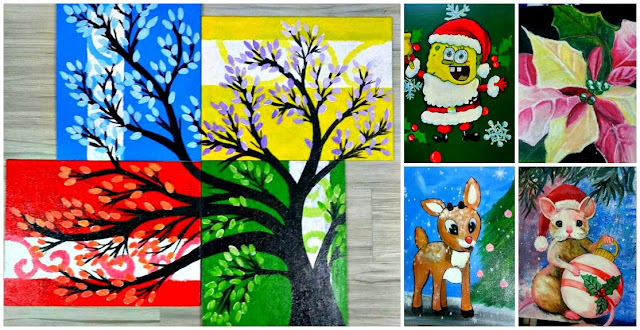 This time the kids will look forward to painting favourite characters such as Queen Elsa, Spongebob, the cute litte Eric Carle's caterpilla, Olaf, cookie monster (awww~ my favourite little blue fella) and more! 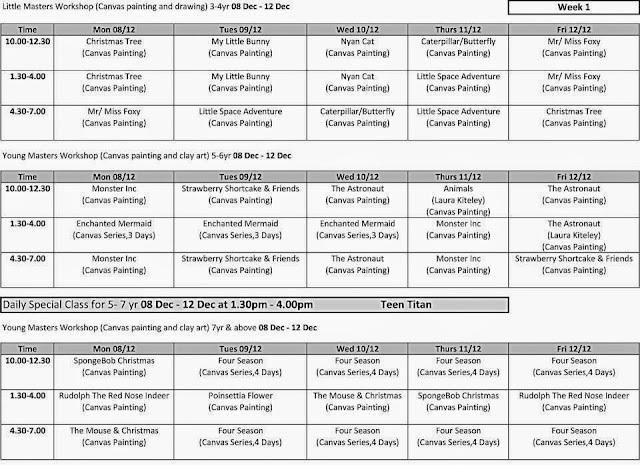 Here are some of the interesting canvas painting for the Young Masters (7+) workshop and the timetable for the holiday programs. 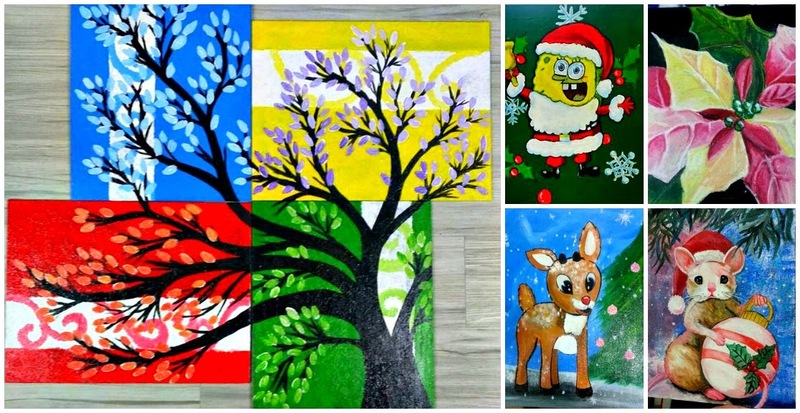 For more details check out HeART Studio's link here. Sign your kids up now to avoid disappointment as their workshops are popular and will be snatched up real fast. They are having a early bird 10% discount is till 23 November 2014 too so hurry and call HeART Studio at 6554 7563 today! And of course the DinoFamily have passes to be given away! However, it is only for Young Masters (7+) workshops. So if your child is at least 7 years old per his last birthday year and month, then quickly read the giveaway details and try your luck! It’s the festive season and the children will get to paint the Christmas Flower Poinsettia. They will also learn to blend colors and understand the color values: Contrasting and complimentary colors. 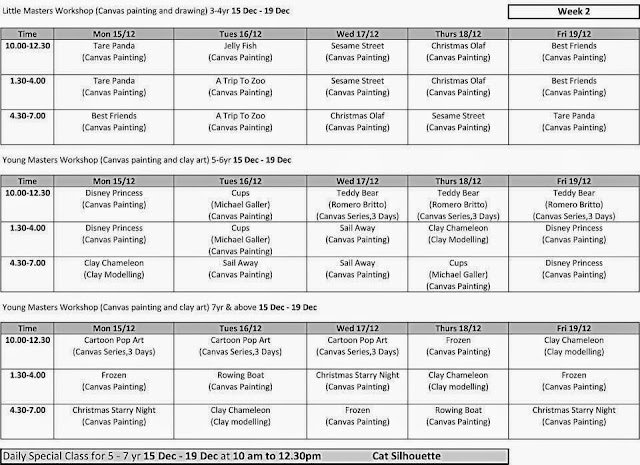 This painting program will open a window of experience for the student to try out canvas painting to the many different interesting subject matters that have been chosen for the class. 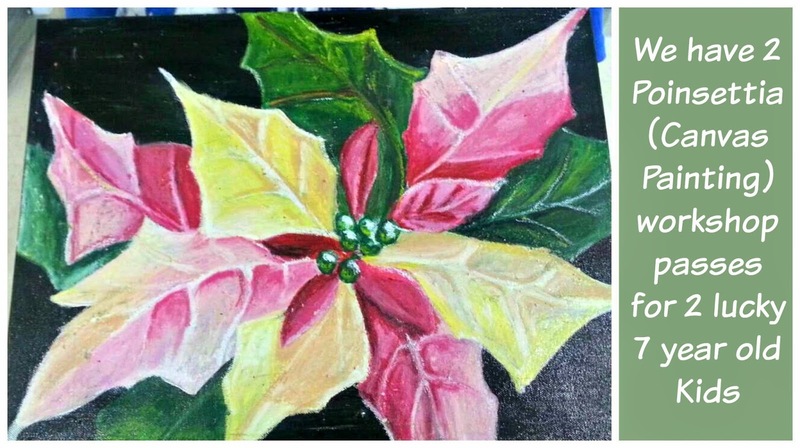 The Aztecs called poinsettias "Cuetlaxochitl." During the 14th - 16th century the sap was used to control fevers and the bracts (modified leaves) were used to make a reddish dye. Today it is known in Mexico as Flor de Noche Buena, meaning Christmas Eve Flower. - The winner will be contacted by HeART Studio directly via email for collection of prize. The DinoFamily's responsibility will end once we pass the winners' details are to HeART Studio. - The child MUST BE be at least 7 years and above, based on the month and year of birth. - No repeat winners are allowed. - Winners will have 3 days to respond by replying to the notification email or by phone call to HeART Studio at +65 6554 7563 (Quote DinoMama giveaway), otherwise, a new winner will be picked. - No changing of date or time is allowed. This is because there are limited slots for these popular workshops and HeART Studio has to set aside specific slots for the giveaway. - We regret that existing HeART Studio customers are not allowed to take part of this giveaway. We have to give other kids a chance to experience the wonderful art learning from those excellent teachers right? Awesome..Thanks a lot for giveaway.. Thanks for all the sharings regarding food education and so much fun! You are welcome Lena =) I am glad that you enjoyed my posts.